Every New Year’s Day, the NHL puts on one of the most exciting games of the regular season: The NHL Winter Classic. This prestigious, outdoor game is the perfect way to ring in the New Year, and one of the only opportunities for fans to take in a game outside of the normal hockey venues. In 2020, the Winter Classic will take place – once again on New Year’s Day – in Dallas, Texas at the historic Cotton Bowl Stadium. The Dallas Stars will host the Nashville Predators in what should be a fantastic battle between Central Division rivals. Is attending this event on your list of New Year’s resolutions? Before you think about purchasing a ticket, here’s a rundown of everything you need to know about the Winter Classic seating chart. 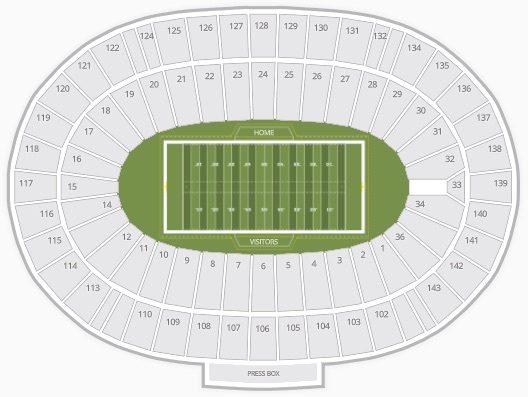 Since Cotton Bowl Stadium normally plays host to football games there shouldn’t be much change in seating layout for the Winter Classic, considering it’s designed like a bowl with the playing surface in the middle. Cotton Bowl Stadium features over 92,000 seats in a bowl shape, meaning there’s no seating angle that won’t offer a good look at the ice on New Year’s Day. Each seating area has a lower tier (1-36) and an upper tier (100s). Tickets to the 2020 Winter Classic and all other NHL events are available through SeatGeek. Browse tickets here, or view select options below once they become available. Don’t forget to use code NHL20 at checkout to save $20 off your purchase of $100 or more. Get NHL ticket deals straight to your inbox.